I couldn’t track down the bench I had seen at Target, so I picked up two of IKEA’s Ammerö seats to try out on the front porch. What do you think? I think it will look great once it’s all styled up. I’ll probably pick up another pair to use at the other far end. Great choice! And on the floor – is that a rug? I love how you combined the cushions with the flooring! That’s the ‘rug’ I painted last year directly onto the porch floor! Hi there! Any tips or recommendations for painting a “rug” directly onto the floor? I’m wanting to do it on my porch, but am a little concerned/nervous about how it will turn out. Any advice you can share would be awesome! is where Lovely painted her porch. I love it! I was wondering how you feel about painting a concrete porch though. They’re a little low and firm, but very comfortable. Brandon likes these more than the other bench; I don’t have a preference. Love how it looks. Perfect height too! Love the look/colours. Do you have any problems keeping the outdoor furniture tidy and clean? The rain/dust/wind makes the (dark gray) chair on my front porch brown and dusty so quickly, I’d hate to see what it does with a white one! Yes, everything on our front porch gets dirty very quickly. The cushion covers come off though and can be machine washed. Looks great! They are definite keepers. I think it looks great. And have you revealed pictures of your white roof yet? I’ve been waiting for those! Oh, there’s nothing to see! The roof is done, but we only did the flat part so it’s not visible (hence no photos). Love it! They look so good on your porch! Where did you move the cute table and chair set? The new seats are very adorable! My mom is working on her yard and I gave them to her. They look good! May I ask where the patterned pillow is from? The chairs are very nice! How is the “rug” holding up? Has the paint gotten scratched or worn down at all with use? There are a couple of small chips, but overall it’s in great shape! It’s dirty though – I need to hose down the floor. I LIKE!!!! is it comfortable though? I really like the look of it. I think they look great actually and may have turned out better than the Target one with your porch. The “rug” still looks amazing. I remember reading about it during the Ace challenge or whatever it was. I love them! You’re making me want to make another trip to IKEA! Lovely! I got similar set from Target.. Need to make some yummy pillows to style it up too!. I love the porch decor! The horizontal green pillow is uber cool. I can’t help but be a little jealous of your large front porch. Ours is 4 square feet. Blegh. I actually prefer the Ikea model. The Target one looks just a tad too formal. They look fantastic! I also love the ‘rug’ what a great idea to add some permanent color and pattern! Oh I love these chairs! I was thinking of getting the small, black, stackable Ammero chairs for a little seating area on our porch. And you took down the green divider! It was so cute! I guess it would just get in the way now with a bench there though. I’m sold on the chairs since you say they’re also comfortable. Just perfect. The pops of green are great. I can still hardly believe you managed to finish that floor while you were preggers. You are a rock star! I really like the new look for your porch. The painted rug is such a cool touch and the decorative cushions complement it well. I can’t wait to see the finished project. What about your hanging planters?? I have been looking for some just like it! I like it! I was all for the Target bench, but if you jazz these up – it will be phenomenal! Suits your porch amazingly! Post the final pictures when you are done! Can I come over and sit maybe share a chat and coffee!? Long story short…cute..very cute! Looks much more “curl up with a good magazine” friendly. I picked up some white cushions from Ikea recently and was pondering a dye job. If the white gets grungy too quickly, I wonder if those would take dye. Love them! Can’t wait to see how you add your creative touch. I am in love with the green planters hanging- where are they from? They are just perfectlike everthing you choose. 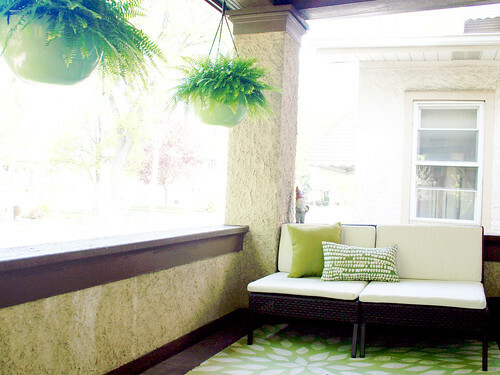 Loving the green cushions….linking the outdoors in. Can’t wait to see the finished product!!! Love this idea. The two seats may end up being a more versatile choice anyway. Good thinking! I didn’t mean to make anyone feel hoodwinked. My mom isn’t working right now (she’s gone back to school to become a teacher). She really loves working on her garden and backyard, but she doesn’t have much of a budget to do so this year. I thought giving her the furniture would be a nice way to share the opportunities I’ve been given (the BHG contest) with her. Certainly understand and very kind of you. It’s funny how perfect strangers get to question you about decisions which have nothing to do with them. Sorry. After your last post, I was keener on the Target furniture more than these benches but they really look fantastic- much better than they do on the Ikea website. The bench looks awesome. Where did you get those awesome hanging pots for the ferns? They look great. Those were from IKEA, last year. I think it looks great! Fresh & crisp. Another two wouldn’t hurt either ;)! IKEA is so my go to place for everything! Love the benches. They look great, and you can have a more flexible arrangement if you need it! you haven’t styled it yet??? Holy moly, it looks fabulous right now. Looks great!! Love the hanging ferns too.